Our regular Friday feature where here at dBs Music we dig the depths of the music production webosphere and discover what downloadable freebies are worth double clicking. 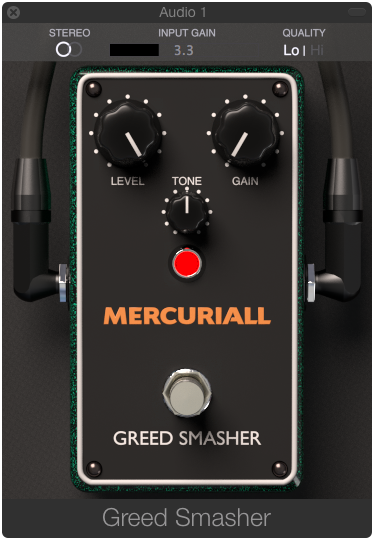 Based around modeling of the classic stomp box by Mesa Boogie, the Mercuriall Greed Smasher is a simple affair from guitar plugin experts, Mercuriall. Simple controls include; Level, Tone, Gain, Input Gain, Mono/Stereo, Quality switch, and the On/Off knob which are all pretty self-explanatory. It's a great free way of injecting some coloured overdrive to any elements of your music, and not just for guitarists. Try it in parallel on a drum or vocal buss to add bite and warmth or on plugin synths to thicken and crunch up your lows. Check the video below from ReaperTV who put the pedal through its paces in a more traditional rock guitar setup that shows off its authenticity.